Protests hit Athens ahead of debt vote Jump to media player Protesters have taken to the streets of Athens as Greek ministers debate measures agreed by Prime Minister Alexis Tsipras as part of a bailout deal from eurozone leaders. Greek bailout: What has been agreed? Jump to media player The BBC's Andy Verity looks at the details of the Greece bailout agreement reached by eurozone leaders. Greece, a nation in waiting Jump to media player As ministers in Brussels try to agree to a debt rescue package for Greece, the BBC's Gavin Hewitt has been assessing the mood in Athens. How the Greece bailout deal was done Jump to media player Ben Bland explains how a deal offering Greece a third EU bailout was reached. Greek reforms - in 60 seconds Jump to media player The terms of a third Greek bailout deal have been agreed, but Greece must achieve reforms in crucial areas to unlock the money. Greek voices: 'Not a viable deal' Jump to media player People on the streets of Athens have been giving their reaction to the deal reached in Brussels. Tricky steps ahead for Greek PM Tsipras Jump to media player The Greek Prime Minister Alexis Tsipras has until Wednesday night to convince Greece's 300 MPs to pass legislation to secure a third bailout and stay in the eurozone. Greek MPs are debating tough economic measures they must approve by the end of the day in order for an €86bn eurozone bailout deal to go ahead. The new legislation includes tax rises and an increase in the retirement age. 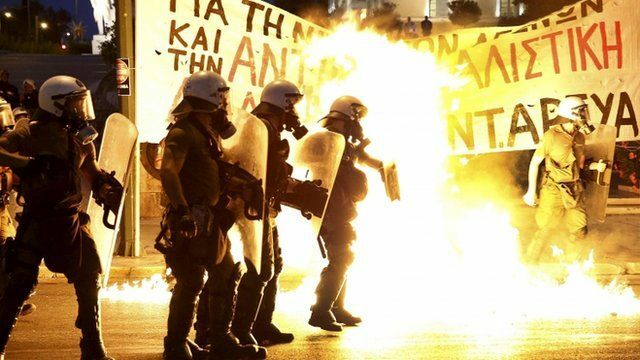 As debate continued, protesters threw petrol bombs at police during an anti-austerity protest close to parliament, and police responded with tear gas. Go to next video: Greek bailout: What has been agreed?